If we could see it as a whole, if they all arrived in a single flock, say, we would be truly amazed: sixteen million birds. Swallows, martins, swifts, warblers, wagtails, wheatears, cuckoos, chats, nightingales, nightjars, thrushes, pipits and flycatchers pouring into Britain from sub-Saharan Africa. It is one of the enduring wonders of the natural world. Each bird faces the most daunting of journeys -navigating epic distances, dependent on bodily fuel reserves. Yet none can refuse. Since pterodactyls flew, twice-yearly odysseys have been the lot of migrant birds. For us, for millennia, the Great Arrival has been celebrated. From The Song of Solomon, through Keats' Ode To a Nightingale, to our thrill at hearing the first cuckoo call each year, the spring-bringers are timeless heralds of shared seasonal joy. Yet, migrant birds are finding it increasingly hard to make the perilous journeys across the African desert. 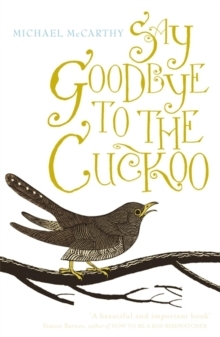 Say Goodbye to the Cuckoo is a moving call to arms by an impassioned expert: get outside, teach your children about these birds, don't let them disappear from our shores and hearts.